The town has a 76 rating on the Long Island Contractors' Association pavement index, which measures road status from 1 to 100, executive director Marc Herbst said. 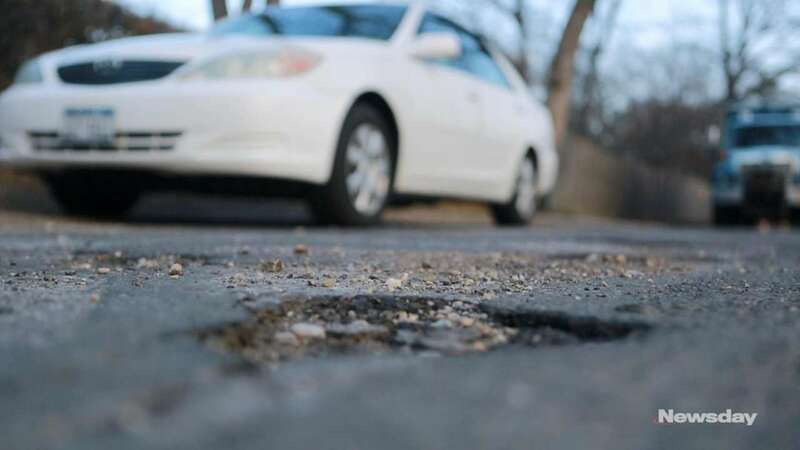 Babylon Town will spend $100 million over eight years to repave and repair aging roads beginning this spring, officials said Wednesday. The Town Board passed a bill Wednesday afternoon authorizing the town to borrow $10 million for road repair in the first year of the program. Supervisor Rich Schaffer, along with other town officials, held a news conference in Copiague earlier in the afternoon, and noted where they were standing on Beverly Avenue is in dire need of repairs, as compared with the newly paved Deauville Boulevard, which intersects with Beverly. He made the side-by-side comparison as an example of what $100 million would do for the town’s roads. “If we don’t do something now, this is going to end up costing us triple,” Schaffer said. The $100 million investment over eight years will save the town an estimated $150 million over that span, Schaffer said, by repairing roads before they’ve had a chance to further deteriorate and require more costly repairs. “We’ll focus on roads that are teetering,” said Tom Stay, the town’s public works commissioner. The Town Board voted unanimously to authorize borrowing $10 million for road repairs this year, with the intention to authorize additional funds each year. The town will borrow the funds, using its AAA rating, and continue its policy of retiring more debt annually than it takes on. In past years, the town typically has spent about $6 million on its roads. This year’s paving season kicks off in the spring and, Schaffer expects, will include about $10 million from the road repair program, and $700,000 from the state’s Consolidated Local Street and Highway Improvement Program — CHIPS. Marc Herbst, executive director of the Long Island Contractors’ Association, noted the town has a 76 rating on its pavement index, which measures the status of the town’s roads on a 1-to-100 scale. “The residents of Babylon have a blue chip investment in infrastructure” Herbst said, showing they have made caring for roads a priority. Herbst said Babylon Town has the highest investment per lane mile among the Long Island municipalities it evaluates.